The 3400 is an advanced automatic vacuum coating system designed for the deposition of dielectric and metallic films. The module is equipped to be interfaced to a wafer handling platform (SEMI height). A single ion source illuminates the selected one, of four available, target positions creating a deposition flux. An auxiliary ion source aimed at the substrate table is available as an option that can be used for wafer pre-clean and/or direct illumination of the growing film. The unique system geometry provides excellent within wafer non-uniformity of material deposition on substrates up to 200 mm. With suitable configuration and the appropriate wafer handling platform, the system is also suited to a coating of 300 mm diameter substrates with very good within wafer non-uniformity. During deposition, the wafer/substrate is rotated within the sputtered material flux while also maintaining an inclination to the flux to optimise film growth homogeneity and morphology. For sensitive reactive processes, the system can be equipped with closed loop partial pressure control for added precision. Modern nano scale technologies need precision manufacturing tools. 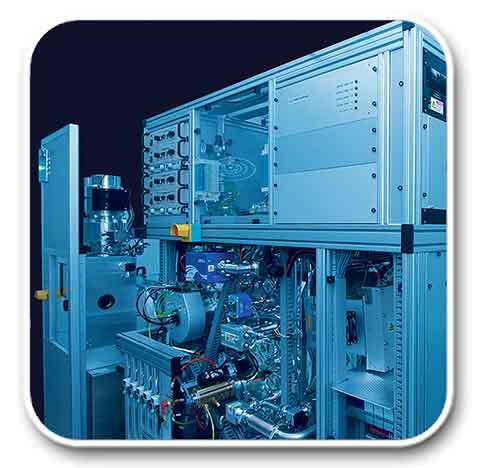 The 3400 dual ion beam system delivers precision ion beams for sputtering applications. This and related Nordiko systems are used in the manufacturing processes for MRAM, perpendicular recording heads used in hard disc drives and microbolometers. They deliver the performance needed when manufacturing a nano scale world.